Just in the nick of time update. Click on the picture to see our original “last look” pictures of the old power plant in our original post. Back in May of 2013, we posted an article chronicling the impending demise and demolition of an old power generating plant in our fair city of Pine Bluff, Arkansas. As one who does not like to see historic structures demolished, I have to admit on this one, the demolition derby was long overdue. The building was long past redemption. The demolition is now complete. Well nearly. The landowner decided to leave the old plant smoke stacks proudly standing. For that, we are grateful. The tall stacks have served as a recognizable landmark for a long, long time. We have updated our original post with a picture of the now empty premises with the stacks proudly standing. We invite you to revisit our original post to see the before, during and after the demolition. Plus, you get to look inside one of the old stacks. We also invite you to take a look at where this story started on the May 13, 2013 Photo of the Week Page at Corndancer dot com where you will see more pictures of the old plant. 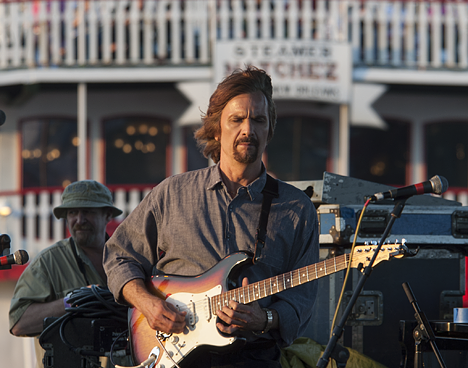 A guitarist and band leader leans way back and is deep inside his tune at Jimmy Buffet’s Margaritaville in New Orleans’ French Quarter during a Saints game weekend in January of 2002. The crowd was appreciative and festive, many of them looking forward to a Saints victory the next day. Their fondest hopes did not materialize. Those were the days when the Saints did not win nearly as often as they do now and in recent history. Being one of a few good ol’boys in a Suburban heading south to New Orleans a few years back was one of my annual events. The trip initially was built around our attendance at a Saints game in the Superdome. This was in the late nineties and early two-thousands when the Saints were not prone to win. That and other considerations led us to follow the suggestion of one of our protagonists that we serve as volunteers in a cold-drink or beer tent for four hours during the French Quarter Fest in April. After the volunteer stint, we were on our own. Click on the guitarist for more pix and info. This story is in two parts. 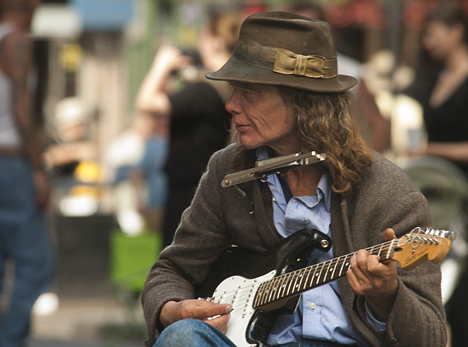 The first part is on the Photo of the Week page at Corndancer dot-com where you will find French Quarter street shots including a guitar duo who were talented far beyond the streets —and a sneaky shot inside a French Quarter restaurant. We’ll wait here while you take a look. There was enough slack time in the game and festival trip schedules to stroll through the French Quarter and capture local color. What you’ll see in this post is a compendium of images from 2002, 2005, and 2006, the year following Katrina’s untoward visit to the Crescent City. 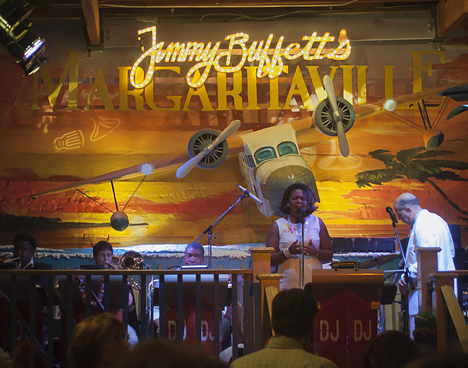 The stage at Jimmy Buffett’s Margaritaville in the French Quarter left no question in your mind as to where you were. The festive atmosphere in the establishment was exactly what one would expect: slightly raucous and fun. 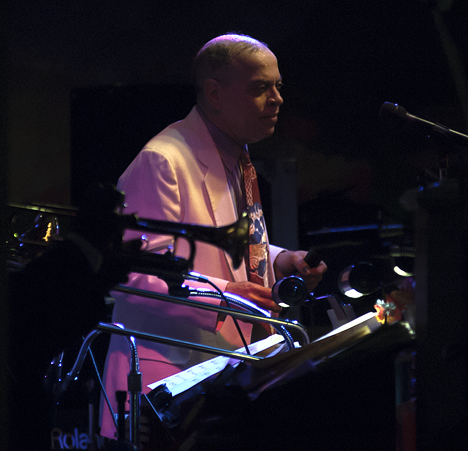 Despite the fact that the date was January 22, 2002 the weather was such that the doors and windows to the Buffett bistro were open which facilitated grabbing this shot of the star performer from the courtyard into the club. 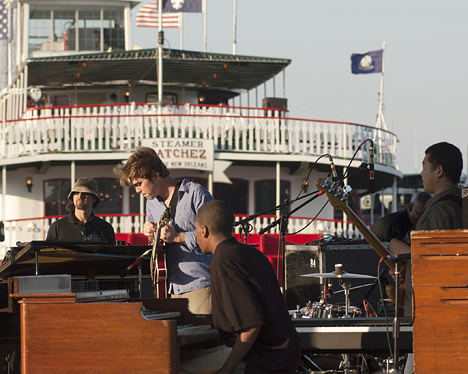 Earlier in the day just off Woldenberg Park and the River Walk, this band performed admirably with the historic stern wheeler Natchez as their backdrop. Where else can you see this? No where. 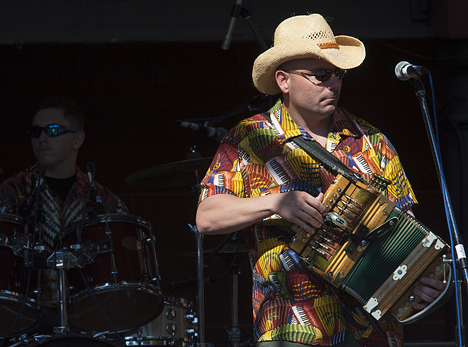 A few blocks away, at another pavilion, Zydeco bands were filling the air with their familiar south Louisiana strains. This guitarist has grabbed a favored spot at the corner of Decatur Street and St. Anne just outside the legendary Café Dumonde during the 2006 French Quarter Fest. I had a favored table at the time and was in good position to capture this performer. Somehow, I got the idea that I was enjoying the moment more than she was. 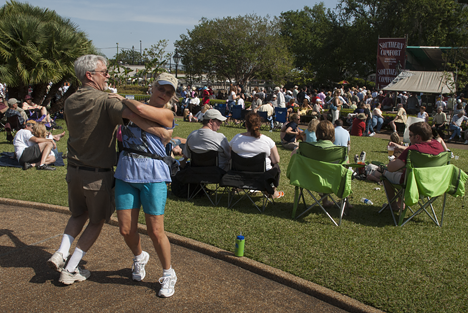 Earlier in the day, I captured this couple cutting a rug in Jackson Square at the base of the Andrew Jackson statue. 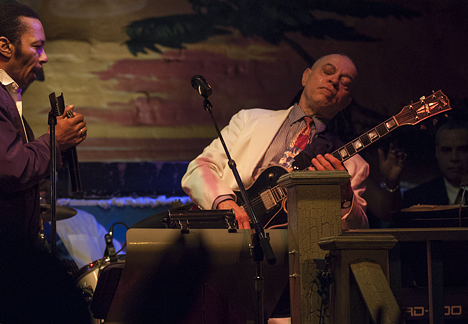 Live music from the nearby Southern Comfort pavilion fueled their movements. 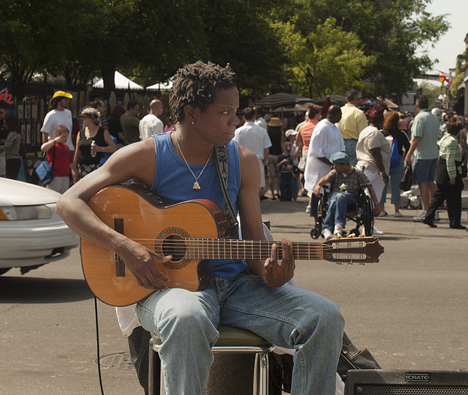 That afternoon, I happened across a guitar duo set up at a street corner. Their “rode hard and put up wet one-time-too-many” appearance was quickly overwhelmed by the quality of their music. You can see more of this duo on the Photo of the Week page at Corndancer dot-com. 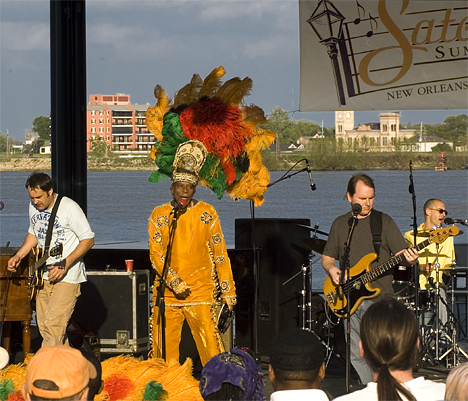 On a riverside pavilion at Woldenberg Park, I captured this performance during the 2005 French Quarter Fest. The singer’s costume, as I recall, had some sort of cultural significance which I failed to record, so it is left to your imagination. Five months later Hurricane Katrina descended on New Orleans with pent-up vengeance. Here’s hoping you enjoyed three years worth of shooting in a short read. I first went to New Orleans as a sophomore in college in 1957. Four of us played hooky from classes to be at the Mardis Gras on Fat Tuesday. 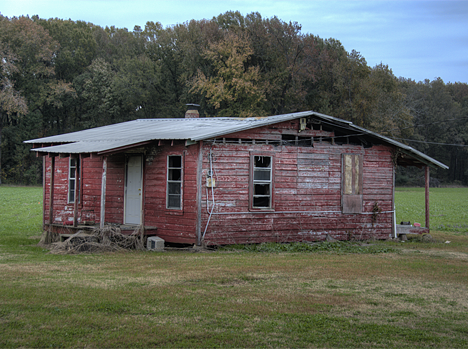 There are also links in the story to show you the old home in its near-disaster condition before moving and re-creation. You will also want to see the original story with more pictures and information on the house in the November 12, 2012 Corndancer Dot-com Photo of the Week page. Click on the barn for a story and five more pictures of it. 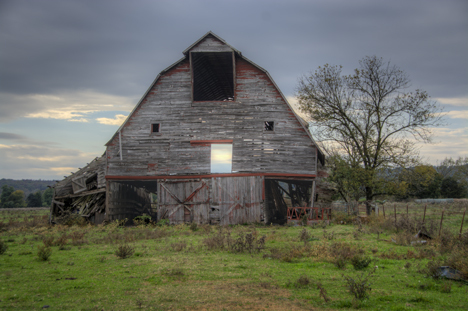 We also invite you to take a look at a “new old barn” on this week’s Corndancer Dot-com Photo of the Week page. 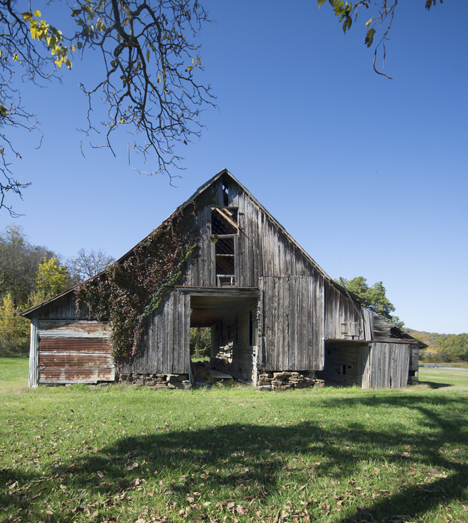 You’ll find six pictures of a rather isolated barn that you could miss if you blink your eye. I say that with authority since I had to look twice when I first noticed it lurking behind a growth of trees alongside a country road. I trust this circus of pictures and links is not confusing and I assure you there is worthwhile content when you click. 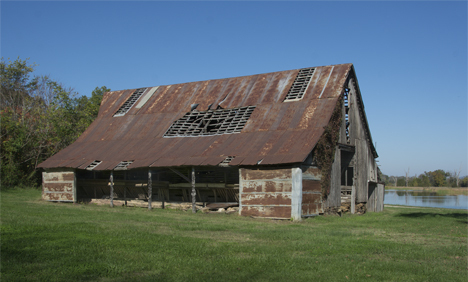 Those intrepid souls who travel from south or central Arkansas to the northwest Arkansas corridor on the back roads have driven past this large deteriorating barn near Elkins, just south of Fayetteville. 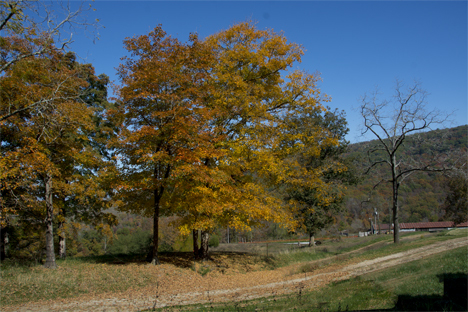 The highway, Arkansas 16, was a bit busy, but fortunately there is a weedy driveway in front of the barn where one may safely park. I shot it going and coming back. This one, on the going trip produced the best results. 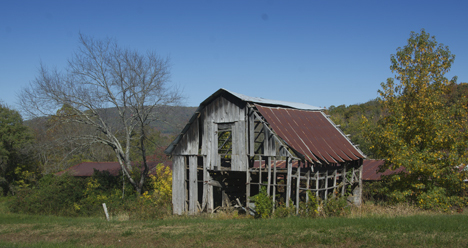 Why do people just let the old barns sit there and rot? My thinking is that these old structures give us a glimpse into our immediate past, a privilege that, since the old structures are falling, will not necessarily be available to succeeding generations. If they are to know, the onus is on us to record them while they are still standing. Click on “Rosie the Riveter” to see more. 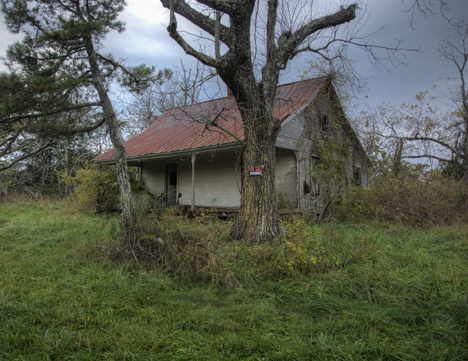 At this point I invite you to see a report on the reason we were in the neighborhood of old barns to begin with. The target of the trip was Crystal Bridges Museum of American Art in Bentonville, Arkansas for a “get-together” of Fort Smith (Arkansas) High School class of 1956 members. Our clever organizers of these yearly, sometimes twice yearly gatherings, do a good job of setting up places of interest for us to gather. This one was a home run. You’ll see some inside and outside pictures of the museum on the Photo of the Week page at Corndancer dot-com. Back to the trip. Our pathway took us through Ozone, Arkansas, a nice little town in the Ozarks. I found an old WPA-built school restored and repurposed to become a community center, the typical abandoned truck and on the north side of town, a totally unexpected hamburger joint and an old barn. Right on Arkansas Highway 21, the Ozone Community Center is neat and nice. 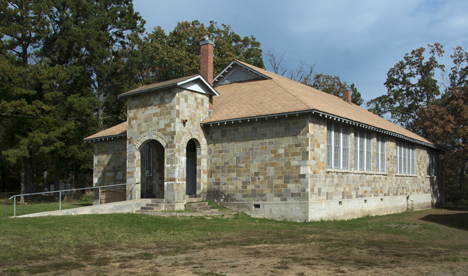 It is a well restored old WPA school with a 1942 cornerstone. I wish it had been open. The center speaks well for the small community. 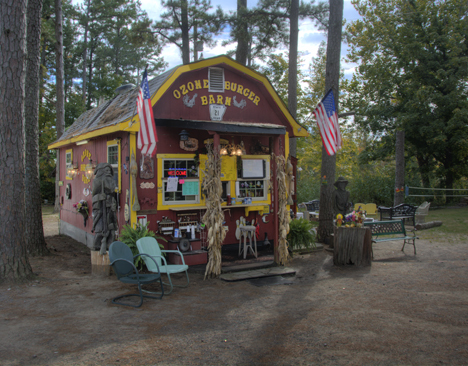 Northbound on highway 21 you don’t see the Ozone Burger barn until you come out of a curve. It is definitely a traffic stopper. One would have to take some time to completely peruse the outside décor. The premises also sports a nice, good-sized pavilion. The place garners some great reviews, proving that excellence knows no geographic designation. 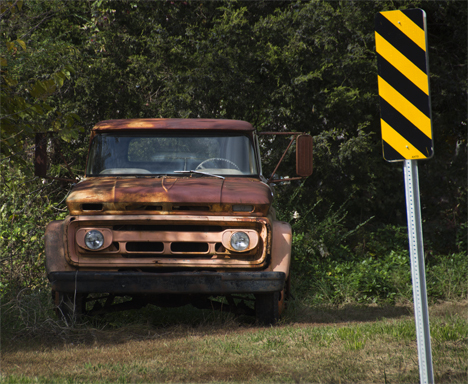 The town of Ozone turned out to be a honey-hole for pictures. Not too far out of town, there was this old barn, right on the highway. A few yards up the highway is what appears to be the remnants of the Boston business district. The last RC Cola and Moon Pie left these premises a long time ago. 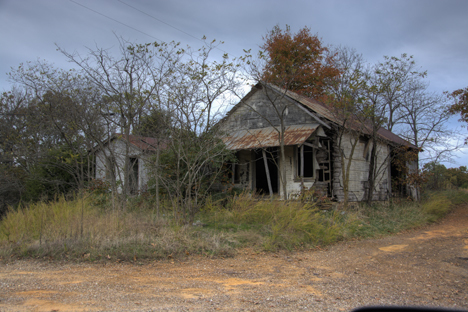 Chances are the establishment was the post office, bus stop, gossip center, and supplier of goods to nearby families. Boston’s “likely” road. The road beside the store meets the criteria for a “likely” road, down which one is likely to find more camera and story fodder. 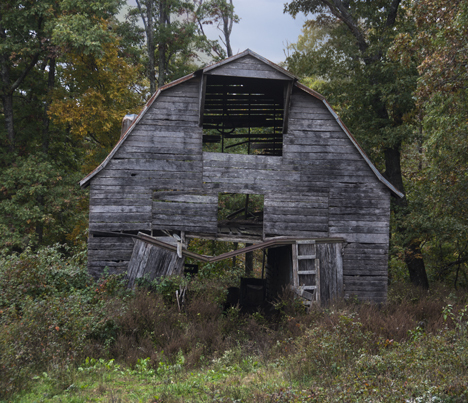 On the return trip to LA (lower Arkansas), at Durham, Arkansas, I found this old barn next to a small pond. I am not certain of the vintage, but, due to the size of the door, it was certainly a “horse-barn.” The door will nicely accommodate an adult on a horse. The head on view of the barn gives one a good glance at the substantial hay loft and the opening through which many a bale passed. 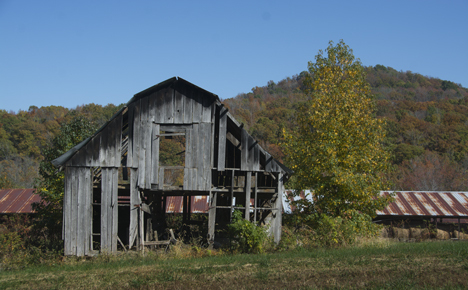 On one of my forays down a side road (which I failed to write down), I found this old barn close to the right-of-way. Notice the pronounced lean to the right. This is a pull-over vista which was well populated buy bikers (the Harley Davidson variety). 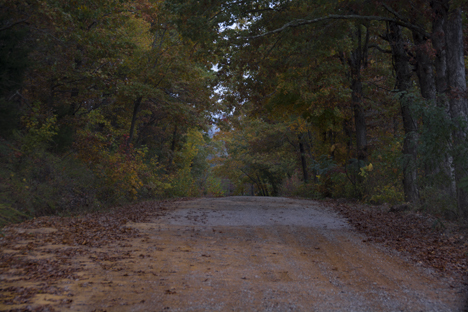 It was October 26 and fall was creeping into the Ozarks. The patches of red, yellow, and orange set off by the blue sky are hard to argue with for a pleasant “lookin’” session. 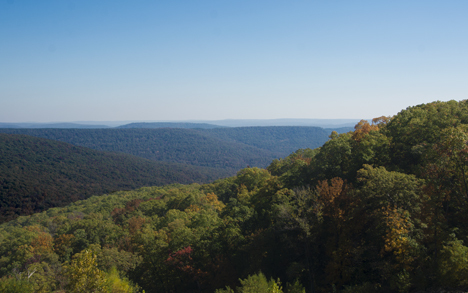 Here’s hoping you have enjoyed a cruise through the Ozarks. It is good for the soul — and on feeding a thirsty full-size pickup to make the trip: “I’d do it again in a heartbeat.” It’s just that good.